Sånt is a tricky word to look up in a dictionary because it is both an inflected form and a contraction. 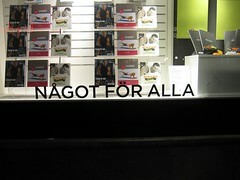 Sånt is a contraction of sådant, the neuter form of sådan, such. 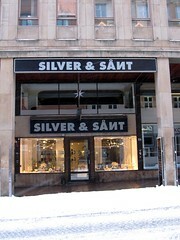 It appears in the phrase sånt är livet (such is life), but Google also finds many business names with sånt, including Ballonger & Sånt, Kaffe & Sånt, Spel & Sånt, Inreda & Sånt, and Silver & Sånt (notably, all with & rather than och). Incidentally, silver is the same word in both Swedish and English, and related words are found as far afield as Russian cеребро.They are all thought to derive ultimately from an Akkadian word. Here’s one to test your skills. 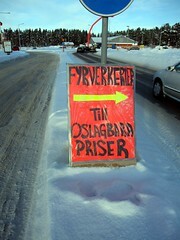 The sign at the right says Fyrverkerier till oslagbara priser, Fireworks for ??? prices. So what about oslagbara? The -a ending is the plural marker, agreeing with priser, so the whole word can be broken down into o-slag-bar-a, which translates as un-???-able-[plural]. Which only leaves one small part of the word left to work out. Unfortunately this small piece is the key to the meaning. To make it easy for you, oslagbara = unbeatable. 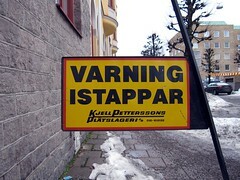 It’s related to the verb slå = beat (in the sense of both hit and defeat), and the noun slag = hit, knock, punch. SAOB says slag is derived from the Old Swedish slagh. The closest English word is slay, which the Online Etymology Dictionary traces back to the Proto-Germanic slakhanan. A slagman is a batsman, and slagverk are percussion instruments. 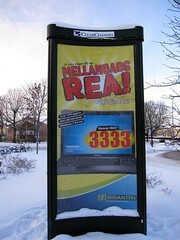 Melodifestivalen is the competition to decide the Swedish entry into the Eurovision song contest; the first semi-final for 2011 is in Luleå on February 5. The common type of music in the competition is a form of light pop known in Sweden as schlager (leading to the competition being referred to as Schlagerfestivalen!). The word schlager itself has the same origin as slag, and seems to refer not to the beat of the music but its impact, just like the English hit. I’ve been remiss not to talk about prepositions yet, but they can be tricky. For instance, once you learn that i means in, or possibly at, it’s confusing to then know that in telling the time, ten to eight is tio i åtta. So I’ll start with an easy one: mellan = between. Apart from the obvious, mellan also appears in expressions such as Mellanamerika (Central America), mellanmjölk (medium-fat milk), and mellanmål (snack, literally between-meal). Mellandag, originally meaning any days between two points in time, has since the late 1800s come to refer to the days between Christmas and New Year (see SAOB for the history). 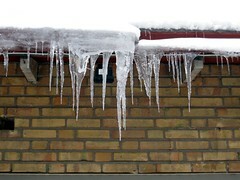 But now the most common use seems to be in the expression mellandagsrea, which Norstedts translates as year-end sales (so they can extend well into January). A specific sort of mellandag is the klämdag, which is a working day that falls between a public holiday and a weekend (so a common time to choose to take a day off work). From klämma, to squeeze, so literally a squeeze-day.